Being a great entrepreneur is more than making profits – it’s about purpose. That’s a key message UNC Kenan-Flagler professor Jim Kitchen teaches undergraduate students in his Entrepreneurship and Business Planning course. Kitchen challenges them to come up with business ventures, and profits go to charities across the Triangle. “This class taught me so much about the importance of incorporating service into our learning,” said sophomore Raven Seldon. Students are expected to generate approximately $1,000 in profits in four weeks. “I thought Professor Kitchen was either joking or that his class was about to be impossible. Little did I know I was getting into a service project that would teach me more about myself as well as the importance and impact of service,” Seldon said. Each class brings new business ideas and higher profits. In 2012, students earned $6,500 in profits. In 2018 students earned $85,000, more than 10 times the first year’s earnings. Part of the success is that students connect emotionally with the project. One charity that has benefited from the students’ business skills is Pee Wee Homes. 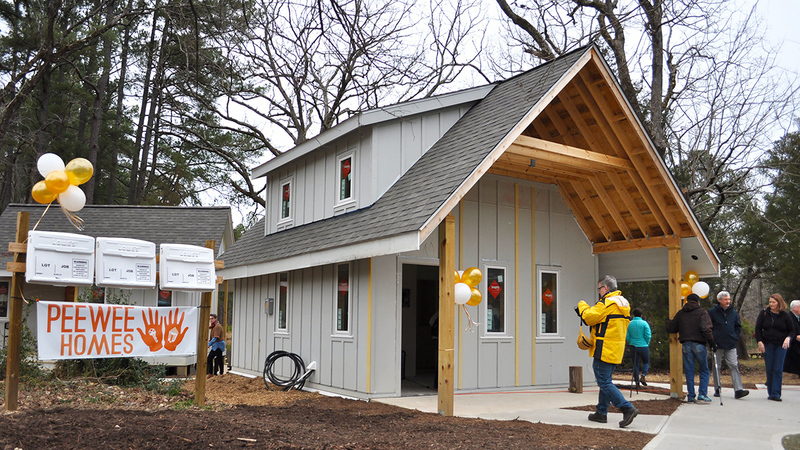 A project of the Church of the Advocate, Pee Wee Homes helps tackle the affordable housing issue in the Chapel Hill area. “The homes support people who are experiencing or who have a chronic history of experiencing homelessness and who are earning below 30 percent of the area’s median income or about $1,000 per month,” said Maggie West, treasurer of the board of directors for Pee Wee Homes. Kitchen’s classes gave $37,000 to help build a home, which will be available for residents in spring 2019. This isn’t the first time West worked with Kitchen. She also collaborated with him when she worked for the Community Empowerment Fund. “Jim approached us about this idea of working with his business class to help provide cars for CEF members who needed transportation for work, medical reasons or for their education who were struggling to afford to buy a car,” West said. To date, course profits have purchased seven cars for CEF members. She appreciates the creativity in the students’ business ventures. “Getting to hear the different ways the students have hustled, earning thousands of dollars in some cases, has been really impressive and inspiring to see,” West said. Kitchen connects the importance of purpose and social investment and community investment in his teachings and through these class projects. “UNC Kenan-Flagler is very good at training students to be consultants and investment bankers. Teaching our students to be well-balanced, and contributing global citizens is equally as important. Students learning how success and wealth fits into their lives — versus being the sole focus of their lives — is critical,” Kitchen said. Kitchen’s fall 2018 classes earned $40,000 toward the construction of more tiny homes at a new site. Also benefiting from the students’ work is the Chapel Hill-Carrboro Public School Foundation, which received $45,000. “We are so deeply grateful to be selected as a recipient of the funding from the UNC Kenan-Flagler class,” said Lynn Lehmann, executive director Chapel Hill-Carrboro Public School Foundation. “These funds will be put to good use to ease the burdens of our overworked and underpaid school teachers. “Professor Kitchen is transforming his classroom into a platform for social change. His dedication to his students, and the Chapel Hill community is inspiring,” said sophomore Laci Motley. And that’s exactly the lesson Kitchen wants his students to learn.